Musculoskeletal disorders are the most common health condition in the United States and the second leading cause of disability worldwide. Dr. LaPrade encourages Congress to increase funding to the National Institutes of Health (NIH) and to support the Next Generation Researchers Act. "NIH research is one of the best investments in our nation’s future and health," said Dr. LaPrade. On Thursday, April 14 orthopaedic surgeon Robert LaPrade, MD, PhD, Chief Medical Officer at the Steadman Philippon Research Institute in Vail, Colorado, attended the American Academy of Orthopaedic Surgeons (AAOS) Research Capitol Hill Day to raise awareness about the debilitating and costly musculoskeletal disorders that are affecting millions of Americans today. Dr. LaPrade and many advocacy teams are urging Congress to appropriate $34.5 billion in the 2017 Fiscal Year to the National Institutes of Health (NIH) and to support the Next Generation Researchers Act. The American Academy of Orthopaedic Surgeons (AAOS) recognizes that scientific and medical innovation depends on their organization’s ability to foster, support, and invest in the next generation of clinician investigators and basic scientists. AAOS supports the efforts of the Next Generation Researchers Act to build opportunities for new researchers, and invest in the future of research, science, and innovation. The President’s Fiscal Year 2017 NIH budget requests $33.126 billion in funding for NIH. This proposed $825 million budget increase for NIH would represent a small increase over the current funding level. Instead, the orthopaedic community urges Congress to appropriate at least $34.5 billion through the Labor-HHS-Education Spending bill for Fiscal Year 2017. Dr. Robert LaPrade is an orthopaedic surgeon at The Steadman Clinic who specializes in complex knee injuries. Having published over 250 peer-reviewed studies, Dr. LaPrade is known worldwide for his research and education in the field of sports medicine. As one of the most prolific researchers in musculoskeletal disorders, Dr. LaPrade has received many awards for his research, including the OREF Clinical Research Award that is considered a Nobel Prize of Orthopaedics. Many of the anatomic-based knee reconstruction procedures used around the world have been developed and tested through Dr. LaPrade’s research. "Musculoskeletal disorders consume a large percentage of our nation’s gross domestic product, but they comprise less than 2% of NIH spending," said Dr. LaPrade. "In order to best address this shortfall, further research is required to improve the treatment of orthopaedic injuries." Musculoskeletal disorders are the most common health condition in the United States and the second leading cause of disability worldwide. 1 in 2 (126.6 million) adults are affected, twice the rate of chronic heart and lung conditions. Musculoskeletal disorders and diseases cost the U.S. economy $874 billion annually and represent 5.7% percent of the country’s gross domestic product. Despite the costly nature of musculoskeletal conditions, funding for orthopaedic research has grown slowly. Musculoskeletal research represents less than 2% of the NIH budget, while burden of musculoskeletal conditions is expected to escalate in the next 10-20 years due to the aging population. Dr. LaPrade said, "NIH research is one of the best investments in our nation’s future and health. For every $10 million in NIH funding, there is an average of 2.5 patents (which often means the creation of start-up companies). In addition, for every dollar spent on NIH research grants, $2 is created in the communities that receive funding." 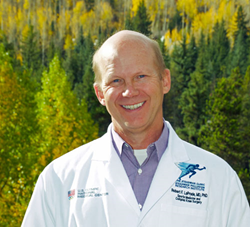 Dr. LaPrade is an orthopaedic surgeon and sports medicine specialist at The Steadman Clinic in Vail, Colorado and Chief Medical Officer and Co- Director of the Sports Medicine Fellowship Program at the Steadman Philippon Research Institute. Dr. LaPrade is personally committed to teaching physicians around the world how to perform knee surgery using the innovative techniques developed by his research team.